In a piece of propaganda that would make Cuba's Castro regime proud, on her Tuesday MSNBC program, NBC chief foreign affairs correspondent Andrea Mitchell cheered the communist state's "highly regarded" health care system, "and especially one of Fidel Castro's signature projects, which is training doctors, doctors who then provide free medical care throughout Latin America." Mitchell proclaimed: "As the U.S. debates health care....We went back to the Latin American medical school here to talk to American medical students about what they're learning about medicine, about Cuba, and about themselves." That soon became disturbingly apparent as student Cynthia Aguilera gushed: "...after graduating with no debt, no worries about paying off loans and having to get a high-paying job, we can return to our communities [in the U.S.] and work in them and try to uplift them the same way that Cuba uplifted us." The New York Times coverage of the Pope's trip to the dictatorship of Cuba has a strange, cheap-shot emphasis on how the Cuban people are coerced to attend such rallies, an authoritarian power play, but one the paper rarely if ever bothers to address during Cuban May Day rallies held in celebration of communism. A nytimes.com search suggests the Times has never previously used the words "orchestrated" or "intimidation" to describe the Cuban government coercing people to attend May Day parades. So why use that explanation for the crowds surrounding the Pope, but leave that obvious explanation off when talking about crowds listening to dictator Fidel Castro's latest multi-hour-drone-a-thon of a speech? Novelist (and Socialist Workers Party member) China Mieville wrote the main essay for the London issue of the New York Times Sunday Magazine, "'Oh London, You Drama Queen.'" According to him, London is a mess of racism and youth alienation, and only free public housing and celebration of loud music on the tube will save it. He also excused last summer's burning and rioting, motivated by a "deep sense of injustice": "Youths taking TVs, clothes, carpets, food from broken-open shops, sometimes with dizzy exuberance, sometimes with what looked like thoughtful care." Even the photo captions are replete with leftist smuggery, contrasting an old-fashioned butcher with a bleak-looking dance club: "Smithfield Market, in Central London, is rooted in the past./The scene at Plastic People, a club in Hackney, looks to the future." Sometimes you read the most interesting things in those supposedly boring trade publications. One such item of interest comes from an article in Manufacturing News (HT to an emailer) written by Richard A. McCormack which is primarily about the Mainland China's designs on the worldwide auto parts industry, including the U.S. Some of the larger American unions are demanding that the administration and Congress take action on what they see as unfair trade practices. One sentence is indicative of a more pervasive problem, and it directly contradicts what the establishment press has been telling Americans for months. It's of particular concern to all Americans because the U.S. government still owns over 25% of General Motors, and reads as follows: "China has told GM that it will not be able to sell its Volt electric vehicle in China unless GM transfers technology to China and produces the vehicle there." One of the Media Research Center's dearest friends and supporters, Mark Levin, has a new book out called “Ameritopia” which as CNSNews reports will debut at number one on the New York Times best seller list in four different nonfiction categories. American Public Media (formerly American Public Radio) says that its "Marketplace" program "focuses on the latest business news both nationally and internationally, the global economy, and wider events linked to the financial markets." 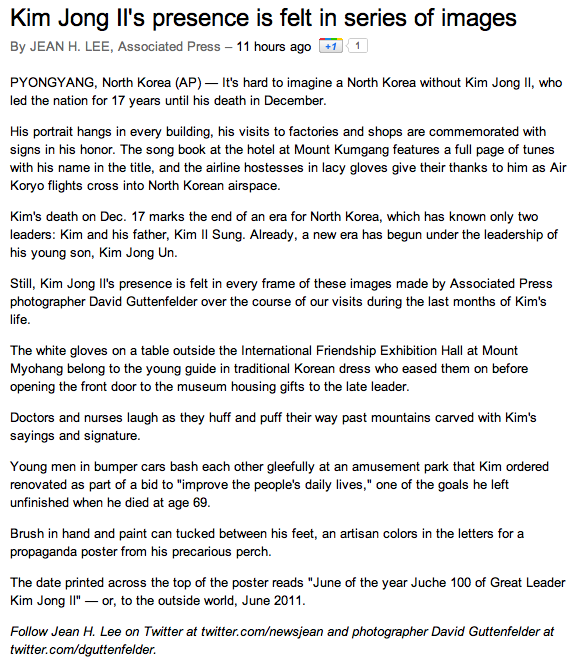 Jean H. Lee's Friday afternoon report at the Associated Press on the omnipresence of images of the late Kim Jong Il throughout North Korea reads more like an audition to be the communist nation's next propaganda minister than a wire service report. At the New York Times Thursday morning, reporter Choe Sang-Hun's covering the funeral for late North Korean dictator Kim Jong Il made it clear to readers that it "The funeral, and the mourning, appeared to have been meticulously choreographed by the government." Meanwhile, over at the Associated Press (saved here at host for future reference, fair use and discussion purposes), a story involving five reporters left the impression that the outpouring of grief was genuine and broadly shared. On Monday, Noel Sheppard at NewsBusters noted how former New York Times op-ed writer (and before that, theater critic) Frank Rich, who now plies whatever his trade is at New York Magazine, criticized MSNBC's Chris Matthews for writing a "man-crush of a biography" about John F. Kennedy, who was assassinated 48 years ago today. Give John Nolte a gold star. In a Friday post at BigJournalism.com entitled "Panicked AP Attempts to Memory-Hole Democrats’ #Occupy Endorsements," Nolte latched onto the beginnings of the establishment press's desperate attempt to distance President Obama and the Democratic Party from the rapidly devolving Occupy movement. In an unbylined item Sunday evening, the Associated Press informed readers that Venezuelan ruler Hugo Chavez, continuing a six-year campaign of agricultural land seizures, has ordered the expropriation of a huge swath of farmland from a British company, and unilaterally decided that any compensation which might occur will be paid in his country's own currency, over which the country's banks exercise strict repatriation controls.